On 01/29/2018 the latin server of S4 League has announced the end of its services, saying "the server will be closed after the termination of our contract with the game development company (Neowiz)". Therefore, since 04/27/2018 (the date in which the latin server officialy entered out of service permanently), several countries can't play S4 League anymore due to legal reasons (IP block). But there's a whole community that loves S4 League and still wanna play this game. You could take it into consideration and wonder the possibility of removing this unnecessary restriction that latin america is suffering, without being able to play on the S4 League Europe. There's no single entity on all America publishing S4 League. Is the european version of S4 League (published by Aeria Games/Gamigo Group) interested on removing the IP restriction? If yes, why aren't we hearing any updates on this? What is the necessary approach to get this done? What we (S4 League players from the listed countries below) could do to help you to get the permission to remove this IP block to these countries? Should we e-mail Neowiz asking them to allow Aeria Games to publish S4 League to latin america? You could get a lot of users from the following countries: Argentina, Brazil, Bolivia, Chile, Colombia, Costa Rica, Ecuador, Egypt, El Salvador, Guatemala, Honduras, Nicaragua, Panama, Paraguay, Peru, Uruguay, Venezuela. I have a facebook group with more than 2,000 users that love S4 League. I've recently done a survey there to see how many people would play S4 League again if the IP restriction were removed, and we got more than 200 users (more than 90% of the answers) saying 'yes'. Please, we are a big S4 League community from several countries and we just want to play our favorite game. We kindly ask you to let us to use your service and enjoy playing S4 League with your community. What's the point of preventing the true S4 League's fans from everywhere on South America to play their favourite game? If yes, why aren't we hearing any updates on this? Kara literally mentions it every week that they're working on it but are still facing legal issues. He even confirmed that Spanish is planned to be added back to the game. EN - I have already done several topics and I continue to do the only thing they say is already something they intend to take the ip block from. would be funnier if n were tragic. for myself it is an inexpensive excuse because the ping of the s4 is based on player by player the server itself basically leaves the game online, if any US player tries to play in Europe against someone for example Germany is obviously going to give lag for the fact of the distance, now if a USA player to play against another of the US the ping would turn green without any delay. (ah but how do you know that? ): when I played on the portuguese server against portuguese players the ping was between 100-130, but when I played here against another brazil from Brazil on the same server the ping was only 70. Nice story and? You want to join S4 EU but not playing with EU players? Well make a private server then only for Brazil people. If everyone is like you the IP ban should stay. my dear friend, where have you seen yourself playing against or with players from another region pinging? is impossible to happen because of the distance, whether s4 or any other game, it is no use denying or trying to reverse this, what they could do is remove the block ip from Latin America for the other Latin American countries to play, and It would not only be one country would be several, but you continue with ignorant and no arguments answers to solve the problem. answering you: I want to play on the European server but against other Latinos, whether it's Brazilian, Argentine, Chilean, Peruvian, Bolivian. So now you want a person from South America to play against someone from Europe with 30 ms is something impossible, unfortunate. complain that the game is high ping is pure bulshit if you are from europe play against people from europe you will not have lag, if you are from north america play against north america, if you are from south america play against people from south america and end of chat, problem solved. Yes you have no clue about S4 EU. The problem here is that you can't play S4 EU. So the problem is actually you. Move on and stop playing S4 = problem solved :o how simple! I don't want to play against 1000k players who'll lag, this will be awful. Ok, let's talk about this "legal stuff", what's the problem of being more clear on this? Aeria Games needs a legal document or an official statement from the S4 League developers (Neowiz) to release the entrance of south america players, right? Why this not happened yet? Aeria Games already talked with Neowiz to get this permission? What Neowiz answered? What more besides talking with Neowiz is necessary to get this "legal stuff" finished? There isn't any clear statements from Aeria Games about the real situation on this legal stuff and I think this lack of communication is very bad to an online game publisher that should be open to your public. Mainly when there are thousands players from everywhere on the world just waiting a simple statement about the current situation on this legal stuff. Don't be rude with your supporters. We were supporters on S4 EU from 2010 to 2014, we were forced to lose our accounts and our access to the european server, than a stupid company (Yuisy) started a sh111t server on latin america with very poor administration until the S4 LA has gone. And here we are. Praying to be accepted back on the S4 EU, where it all began. Does Aeria has an ETA to deploy the solution to these lag issues? I agree this is critical and a priority. I would like to have a more clear statement about this. I'm a lawyer, I'm getting on you and ask you "what are these legal issues"? If you want to be helped you have to give more details about it. How much time is necessary to solve this "legal stuff" and why? We are struggling to get a clear communication channel with Aeria. How long do we have to wait? What is expected time to get this done? The post was edited 1 time, last by FilipeMarch ( Jul 31st 2018 ). again the argument, only arrogant answers, should be the reason why S4 does not grow, it is explained ... it is because there is a minority that refuses to want to grow and change its concepts about the rest of the regions, I believe not It is worth trying to talk to an ignorant intellectual. refuses to want to change, with that retrograde thinking does not really. I just wanted a simple thing, to create a portuguese server and let the brazilians and latinos play it, no one would have lag and everyone would be happy and contribute with the majority in the base player, but because of people like you maybe that has not happened yet. Nope no ETA for everything here. Write in English. This is the English section. I'm also not writing german here. the point is that there is no solution for this, whether it's for big or small games, it's simple the regions are far away if they play together the ms will be high, but how would a region so far contribute to something in Europe? having something that had before and now no more, a server to play among ourselves as it was formerly in season 2 for example, where the Brazilians and Latinos played on the Portuguese server and all had low pings, most of the players were donates, we were of 30-40% of the player base of the time, at the end of weeks the servers some of them were full and that was cool guy. but nowadays there is a minority that refuses to do it again, why? I do not know, but it seems to me some kind of preconception with our region being that we would only add to many good things for the game. Yes its only the fault of people like me. Like I have anything to say what Aeria Games + Gamigo decides lel... S4 League does not grow because of many reasons but how should you know. again only arrogant and ignorant answers on your part, I do not know why a player who does not respect the other players is still on the forum, it's all because we're Latino, man I do not know you and you want to offend me for free, review his concepts and ceases to be ignorant of his racism. He didn't say that he doesn't want to play with EU players. He just've said higher pings come from people very far each other, since this is the nature of a non-authoritative P2P approach, which S4 League uses. If you don't understand it, please research a little before talking nonsense. If you play S4 League with your brother on your home, you'll get 7 ms ping. If you play with a japanese player, you would get more than 200 ms. This is the nature of any P2P games. You should learn more about the basic functionality of online games. This is the reason S4 EU has a lot of servers: German, French, Russian, Turkish, North America and Europe servers. Each server is directed for closer players in these regions. But everyone can play together on the Europe server, since this game has not so many players as on the past. If you don't want so much lag, just can choose to play with only europeans and not with US players. Not everyone requesting to enter on S4EU is from Brazil, you should be more respectable with all these players that made this game alive for years. We just want to play our favourite game. If south america people started to play again, they would have one server to play together. If you don't want to play with us, just don't enter on the south america server. If you don't want to play with Germans, don't enter on German server. If you don't want to play with French, don't enter on the french server. Hello, B3mo, thanks for this information. I've just written one line in another language, but I'm sorry for that. Who is the right person to ask? Well, I have emailed Neowiz, Gamigo and Aeria. But I still haven't got answers. People from closer regions can play together. There is a server called Russian server. There is a server called German server. There is a server called Europe server. As you can see, the player chooses the server he'll play on from his location. If we started to play Aeria back, we would just choose our region (or closer region), obviously. But nothing prevents the US people from playing on the european server, it is just an option. It is not useful to try to talk to a *******, he does not understand something simple of what is P2P and that is to create a server either PT or LA, remove the block ip and let us play, we would not inflate at all in pinging it, but if he refuses to believe that we can not do anything, talking to a guy who has no argument will not get us anywhere. FilipeMarch Please do not spam. There is a edit button. Well first I would contact our PM via discord would probably be the fastest way if he answers you. And thanks for writing all down about P2P but that is actually not the problem and I never complained about the ping. We are keeping this game alive actually not you. Do you have a link to PM's discord? What is this sentence for? "We are keeping this game alive actually not you"
We are still playing using VPN, so removing the IP ban would just cause us to don't use VPN to enter on the game and get better pings. When we are playing the game and spending time with it, we are making it alive. I don't know why but it seems like you are teenager and are always trying to figure out a way to troll on the forum. Please, if you do not want to contribute, do not harm us. Why would you try to harm anyone that hasn't done nothing to you? Be kind to the person behind the screen. You are not talking with bots, but with real humans with good intentions and values. The portuguese/spanish server was made for people of Mexico, Spain and obviously Portugal, we are talking about a license for NA and EU back then. That server wasn't made for LATs to begin with and it was always full of salt, rage and whinning thanks to the lag. If you ask me, i'm not willing to see that in the game again. Time zone is something to take in consideration, but it already got some serious lag by 4~5PM EUR time back then, the reason why i both moved to the english forums and server was because that server ended up being a real mess. That said, keep in mind i'm not saying that i don't take in consideration other opinions about the topic so don't heat up that fast. The post was edited 1 time, last by Shanic ( Aug 1st 2018 ). but latam was the region said to be removed the block ip, and it seems that there are some people who do not want to play the game, they could collaborate and the game would only have to grow and win. nothing against the other regions, I at least wanted the server to be global would be a dream . Don't expect anything all they are good for making promises and all and look at us now. Been waitin since 2011 for improvements of the game and how did it fare. Let me tell you this AeriaGames will Drop S4League, mark my words if I say so. It's gonna take them another half a decade to fullfil the communities wishes. And by that time the community is dead. Them Q&A are nice and all but for every question the answer is " We don't know // We are working on it // Legal issues " Its the same story. Q&A Vids is the answer. basically I feel shameless xenophobia, no more. As you can see, the S4 EU could turn into a global server. I hope it doesn't miss this growth opportunity. This game deserves. As you can see, the North America server was made for people of NA. But there isn't any US player on the North America server, every US player is on the Europe server. Just because there aren't enough players to every server, you know the game is abandoned. 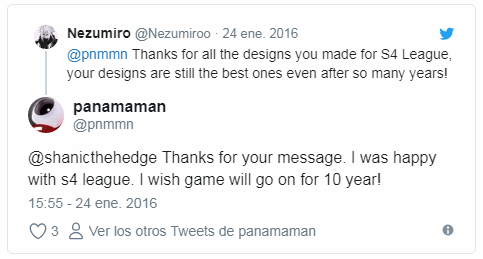 And so what if the game wasn't inittialy made for LATAM? Are you complaining just because we are LATAM? Do you think you are of some kind of superior race just because you're on Europe? Let's start studying, boy, we share the same genetic code, the DNA. You are not so different from us. The server (a computer) is made to handle UDP packets on the internet, messages sended by clients (another computers). The server doesn't differentiate clients by nationality, every client is just a client sending messages through some internet protocol. Stop talking about something you don't know how it works. It doesn't matter the place you are from. The functionality is the same to server's perspective. You are just lying because I played years on these servers and I haven't had any lag problems. Every portuguese, spanish or brazilian player was with very low ping (less than 100ms). All the game is full of salt and rage, this doesn't change from England to Portugal. The lag will always happen with very far players. If you try to play against japanese players, you'll understand it. They have better internet than you'll ever have. But you will still be full of lag to them and them to you, just because you are very far from each other. Start understanding how the packets are handled on the internet, any child can learn it. So you will understand the delay issues. These are handled by communities, playing with players closer to them. So if we started to play on S4 EU, naturally we would look into playing with players closer to us, with lower pings. This is just a basic concept on any online game, why don't you try to understand it before continue talking nonsense and being full biased? So you're saying that you don't want humans from 20 different countries from yours to be able to play the same game you're playing just because if you played with them, you would get higher pings. But who is asking you to play with us? Who is forcing you to play with us? The rules of the game do not change if we enter on it. You will still choose the server with closer location players to play with, and we will do the same. Do you think the rules are different to us just because we are from a different place? This type of attitude seems more typical of a selfish child who does not like to share their parents' attention or share their toys. Come on, this is a server. The server will remain the same with LATAM being forced to use VPN to enter on the game or not. Stop thinking only about yourself and try to solve a problem that affects everyone on dozen countries. Stop being the typical child that says "the problem is not mine, so I don't care, I don't want to help, I don't want to share anything, everything rounds around me". This is not just about you. It is about thousands players that just want to play together, and you are the one who is trying to prevent them to accomplish this. Stop just pointing out problems and try to bring solutions. The lag can get cut out by putting closer players to play more frequently, far players to play rarely. Therefore, the creation of specific servers and channels for closer regions is the solution. Create the LATAM server if you wish so. We will just choose this option as it is far more convenient to play talking on our main language. Nothing would change for you - that feels offended by our presence - if we were playing on the LATAM server. So why are you still trying to harm us? As I already said, there are humans behind the screen, stop thinking you are cool just because you are trolling on the internet. This is not even funny. The post was edited 1 time, last by FilipeMarch ( Aug 1st 2018 ). You can be as pessimistic as you want, but I'm not going to give up as easy as you. If you do not expect anything good for S4, what are you doing here? I mean, I'm not throwing you out, I just see that you're complaining, from Aeria Games when they've just taken over the development of the game recently. What do you think that i'm here from yesterday? I'm here from the post-release of the game and i saw everything happening on this game. But i can't lose the hopes on this game. I'll say it once, stop insulting someone that has a different opinion, have i said anything about yourself? If you can't accept the fact that people are different then you are in the wrong forum. I didn't read further than "Do you think you're superior?" as you already show how much weight your facts have when you have to throw such words into a topic. If you open a thread/topic, be ready to have answers you don't like, but whatever you do never go so low on others just because you are running out of words to defend your opinion, theres no need and theres no good outcome out of that. really you were the one that tried the least to offend us, but some are only here to cause discord, even medical the talking guys that we need, being who is having a scrotal attitude is some of you. this is all because we are Latino, not wanting to victimize but some attack us for free if you read above you will find some offenses.